Primary care providers (PCPs) face many system- and patient-level challenges in providing multimodal care for patients with complex chronic pain as recommended in some pain management guidelines. Several models have been developed to improve the delivery of multimodal chronic pain care. These models vary in their key components, and work is needed to identify which have the strongest evidence of clinically-important improvements in pain and function. Our objective was to determine which primary care-based multimodal chronic pain care models provide clinically relevant benefits, define key elements of these models, and identify patients who are most likely to benefit. To identify studies, we searched MEDLINE® (1996 to October 2016), CINAHL, reference lists, and numerous other sources and consulted with experts. We used predefined criteria for study selection, data abstraction, internal validity assessment, and strength of evidence grading. We identified nine models, evaluated in mostly randomized controlled trials (RCTs). The RCTs included 3816 individuals primarily from the USA. The most common pain location was the back. Five models primarily coupling a decision-support component—most commonly algorithm-guided treatment and/or stepped care—with proactive ongoing treatment monitoring have the best evidence of providing clinically relevant improvement in pain intensity and pain-related function over 9 to 12 months (NNT range, 4 to 13) and variable improvement in quality of life, depression, anxiety, and sleep. The strength of the evidence was generally low, as each model was only supported by a single RCT with imprecise findings. Multimodal chronic pain care delivery models coupling decision support with proactive treatment monitoring consistently provide clinically relevant improvement in pain and function. Wider implementation of these models should be accompanied by further evaluation of clinical and implementation effectiveness. Question: What multimodal models of pain care delivery provide clinically relevant improvement in pain and function? Findings: Five models primarily coupling a decision-support component—most commonly algorithm-guided treatment and/or stepped care—with proactive ongoing treatment monitoring have the best evidence from mostly good-quality randomized trials. These models show clinically relevant improvement in pain intensity and pain-related function over 9 to 12 months (NNT range, 4 to 13), as well as variable improvement in other important core outcomes, including quality of life and mental health. Meaning: It is reasonable to consider wider implementation of one or more of these models, with a clear plan for further evidence development to address shortcomings of previous research. In light of the current prescription opioid overdose epidemic, chronic non-cancer pain is a public health concern of growing importance. When defined as pain lasting longer than 3 months, an estimated 100 million US adults suffer from chronic pain, at a cost of $560 to $635 billion per year due to medical treatment and lost productivity.1 Chronic pain is complex, involving dynamic interactions between biological, psychological, and social factors unique to each individual,2 and most patients suffer from comorbid conditions.3–6 To address this complexity, some pain management guidelines recommend multimodal pain care,1, 7–9 which is typically defined as the use of more than one type of therapy and can include more than one discipline when available (multidisciplinary). Common modalities include self-management; complementary and integrative health; pharmacological, psychological, physical, or restorative therapy; and procedural treatments. Primary care providers (PCPs) are responsible for the majority of pain management.10 However, PCPs face many system- and patient-level challenges in providing the recommended multimodal interventions.1, 10, 11 In their 2011 “Blueprint for Transforming Prevention, Care, Education, and Research,” the Institute of Medicine’s Committee on Advancing Pain Research, Care and Education found that reimbursement limitations and short primary care visits often provide inadequate time and resources for complex treatment planning and coordination of multimodal care, monitoring, and patient education and activation activities.12 A 2015 Patient-Centered Outcomes Research Institute (PCORI) multistakeholder workgroup suggested that system-level care delivery models are needed to support PCPs and provide better tools for managing chronic pain.11 Ideally, system-level multimodal chronic pain care delivery models would include (1) medication management, (2) access to multidisciplinary treatment modalities tailored to comorbidity needs, (3) decision support for clinicians, (4) self-management support for patients, (5) dedicated care management staffing to support ongoing interdisciplinary treatment coordination and monitoring, and (6) health information technology (HIT) enhancements, such as telecare, to better facilitate timely communication and monitoring. In the past few years, several such care delivery models have emerged. However, these differ substantially in their key components, and work is needed to identify which have the best evidence of clinically important improvements in pain and function. We reviewed evidence of the effectiveness of models for improving the delivery of multimodal chronic pain care within the primary care setting. Our objective is to determine which multimodal care delivery models, integrated within the primary care setting, provide clinically relevant benefits in pain and function and minimize unintended consequences in adults with chronic musculoskeletal pain; to define key elements of these models; and to identify patients who are most likely to benefit. We searched MEDLINE® (Ovid) and CINAHL from 1996 to October 2016 using terms for chronic pain and health care delivery models (e.g., “primary care planning,” “disease management,” “multi-component,” “chronic pain”). We searched numerous other sources, including Cochrane Database of Systematic Reviews, Agency for Healthcare Research and Quality, Google Scholar, and more to identify existing systematic reviews and gray literature; a complete list of our search strategy can be found in our full report.16 Additional citations were identified from hand-searching reference lists and consultation with content experts. We limited the search to articles involving human subjects available in the English language. Study selection was based on the eligibility criteria described in Table 1. We abstracted data from all included studies on the setting, model components, follow-up duration, patient demographics, comorbidities, pain characteristics, and results for each included outcome. We rated study quality using the Drug Effectiveness Review Project methods for randomized controlled trials (RCTs)18 and risk of bias using the Cochrane’s Risk of Bias Tool for cohort studies.12, 19, 20 Study selection, data abstraction, and quality assessment were first completed by one reviewer and checked by at least one additional reviewer. Disagreements were resolved by consensus. • Potential effect modifiers of interest include (1) the specific location and/or type of pain, (2) patient demographics (e.g., age, race, ethnicity, and gender), (3) patient comorbidities (including past or current alcohol or substance use disorders, mental health disorders, medical comorbidities, and those at high risk for substance use disorders). Intervention: Any model with system-based mechanisms aiming to increase the uptake and organization of multimodal care (e.g., collaborative care, care management, integrated care, telecare, peer-delivered care, informal caregiving, stepped care models, and algorithms). • Effectiveness: Percentages of patients obtaining reductions in pain intensity and pain-related function from baseline of at least 30 or 50%,17 quality of life, depression, anxiety, sleep, and opioid doses. • Unintended consequences: Adverse effects on patient satisfaction, provider satisfaction, time burden, sustainability. Timing: Any study follow-up durations. Setting: Integrated within primary care; not to include interventions occurring entirely within intensive pain rehabilitation, specialty, or tertiary care. Study design: Systematic reviews, randomized controlled trials, or concurrently-controlled cohort studies. We graded the strength of the evidence based on the AHRQ Methods Guide for Comparative Effectiveness Reviews.21 This approach incorporates five key domains: study limitations (includes study design and aggregate quality), consistency, directness, precision of the evidence, and reporting biases. Ratings range from high to insufficient, reflecting our confidence that the evidence reflects the true effect. Strength of evidence ratings was first completed by one reviewer and then checked by another, and we resolved disagreements using consensus. Models of multimodal chronic pain care differ substantially in the types of system interventions they use to promote guideline-concordant multimodal chronic pain management in the primary care setting. Sources of heterogeneity include number, breadth, intensity, frequency, and duration of components. This type of heterogeneity is often characteristic of complex multicomponent interventions and can be a challenge to constructing a framework for organizing the evidence synthesis. This is because interventions can be conceptually lumped or split by various types of characteristics and there is no agreed-upon single best approach for doing so.22 Given the model heterogeneity, we did not perform any meta-analysis. 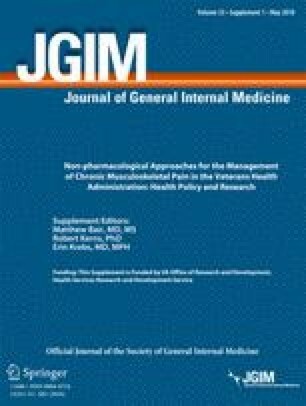 Instead, we qualitatively described the model characteristics, organized by the four most common system interventions they used to promote guideline-concordant multimodal chronic pain management (Table 3): (1) decision support, (2) additional care coordination resources, (3) enhanced patient education and activation, and (4) increased access to a broader range of treatments. We summarized effects on outcomes by grouping them into three categories based on the models’ main focus: (1) decision support coupled with proactive symptom monitoring, (2) risk-matched treatment pathways, and (3) increased access. Searches resulted in 901 potentially relevant articles (Fig. 1). Of these, we included eight RCTs (in ten publications)2, 23–25, 27–29, 31–33 and one retrospective cohort study.26 Overall, most studies were fair or good quality (Table 2, Fig. 2). Common limitations among fair-quality studies included greater than 20% attrition and baseline differences in potential prognostic factors. Poor-quality studies also excluded 34 to 47% of patients from analyses. Fidelity to case management protocols was adequate but was rarely mentioned for provider training and enactment of skills. Despite robust methodology, the strength of the evidence is generally low as each intervention is only supported by a single, imprecise study. All but one study27 were randomized at the patient level, and most interventions were compared to usual care, often minimally described as regular access to primary and specialty care. Forest plot: improvement in pain and pain-related function. Measured by Roland-Morris Disability Questionnaire. †Measured by Brief Pain Inventory, ‡Rate of improvement for model vs usual care. Abbreviations: ESCAPE = Evaluation of Stepped Care for Chronic Pain; NNT = number needed to treat; NR = not reported; RCT = randomized controlled trial; RB = relative benefit; SEACAP = Study of the Effectiveness of a Collaborative Approach to Pain; STarT Back = stratified primary care management for low back pain; SCAMP = Stepped Care for Affective Disorders and Musculoskeletal Pain; SCOPE = Stepped Care to Optimize Pain Care Effectiveness. The McMaster Family Health Team (MFHT) in Hamilton, Ontario, implemented weekly group sessions to increase access to and coordination of specialty services.25 After 6 months of follow-up, there was a statistically significant improvement in the SF-36 physical domain. But this model’s single small study (N = 63) with only 50% adherence provides insufficient evidence on which to draw conclusions. To our knowledge, this is the first review to evaluate the effectiveness of models to improve multimodal chronic pain care delivery in the primary care setting. Eight RCTs2, 23–25, 27–29, 31–33 and one retrospective cohort26 of mostly fair or good quality identified five models that primarily coupled decision support with proactive treatment monitoring as having the strongest evidence of providing clinically significant improvement in pain intensity and pain-related function over 9 to 12 months (NNT range, 4 to 13): ESCAPE,2 SEACAP,27 STarT Back,29 SCAMP,30 and SCOPE.31 Four of the models27, 29–31 also showed improvements on at least one of the additional important outcomes of quality of life,29–31 depression,27, 29–31 anxiety,30, 31 and sleep.31 Despite strong methodology, however, the strength of the evidence is generally low, as each intervention is only supported by a single study with imprecise findings. Our ability to rank models from best to worst is somewhat limited by heterogeneity in outcome assessment methods, patient populations, and setting. The SCAMP30 and SCOPE31 models stand out as having the potential to be better than others, because they resulted in the greatest clinically significant improvements in pain intensity or pain-related function (NNT’s of 4 compared with NNT’s of 8 to 13). SCAMP and SCOPE share many components with other models, such as weekly case management meetings, pharmacotherapy algorithms, care coordination teams, and access to mental health treatment. However, SCAMP and SCOPE are the only models to include a clinical pain and/or depression specialist on their case management team, which may have contributed to their greater patient improvements. The least comprehensive model, in which pharmacists and physiotherapists focused on medication optimization, exercise, and self-management, produced no clinically important improvement at 12 months.28 Compared to other models, this model was the least comprehensive in addressing the complex range of biological, psychological, and social factors faced by individuals with chronic pain. For example, this model did not appear to include any access to mental health treatment. A limitation of the evidence base is its generalizability. These models were primarily implemented within a large integrated VA health care system with a developed patient-centered medical home model for primary care that shares a common electronic health record with specialists and hospitals and can include integrated mental health services. Implementing the models identified in this review may be more challenging in smaller, less integrated health care settings. Also, they are most applicable to middle-aged male populations seen at VA primary care clinics for low back pain and may not be widely reflective of all patients with chronic pain or those seen in a broader range of specialty settings, including multidisciplinary pain clinics and rehabilitation centers. We were unable to determine the patients who are most likely to benefit from these models due to under-reporting of key patient characteristics such as pain duration, opioid use at baseline, and prevalence of common medical and mental health comorbidities. Additional limitations of the evidence base include (1) each model was supported by a single study; (2) incomplete evaluation of model fidelity; (3) only half to a small minority of studies measured IMMPACT-recommended outcomes17—50% for depression, 40% for anxiety, 10% for sleep, 30% for opioid use, and 20% for unintended consequences; and (4) that sustainability is unknown because follow-up was limited to 12 to 18 months. The primary limitations of our findings related to our review methods include (1) our literature search, (2) our focused scope, and (3) our use of sequential instead of independent dual assessment. For our literature search, limiting to English-language studies from MEDLINE and CINAHL, coupled with the inconsistent terminology used in the literature on complex multicomponent health care interventions,22 may have increased our risk of missing relevant studies. We addressed this challenge by including a wide variety of terminology in our search strategy (e.g., “primary care planning,” “disease management,” “multi-component,” “chronic pain”), as well as searching a wide range of other sources. Second, to meet our condensed timeframe, we focused our scope to the setting of primary care, because it is responsible for the majority of pain management, and, for benefits, to IMMPACT-recommended outcomes. Although our scope captures the highest priority needs, it limits applicability to other settings in which pain care occurs, such as multidisciplinary pain clinics and rehabilitation centers and to other outcomes of pain care, such as patient satisfaction. Third, although sequential dual review is a widely-used method, its comparison to independent dual review has not yet been empirically studied and may have increased the risk of error and bias. Five models primarily coupling a decision-support component—most commonly algorithm-guided treatment and/or stepped care—with proactive ongoing treatment monitoring have the best evidence from good-quality RCTs of providing clinically relevant improvement in pain intensity and pain-related function over 9 to 12 months, as well as variable improvement in other important core outcomes. National health care systems may be encouraged to consider wider implementation of any of those models with a clear plan for further evidence development to addresses shortcomings of previous research. The VA Evidence-based Synthesis Program (ESP) is funded by Quality Enhancement Research Initiative (QUERI). The findings and conclusions in this report are those of the authors and do not necessarily represent the official position of QUERI. The views expressed in this article are those of the authors and do not necessarily reflect the position or policy of the Department of Veterans Affairs or the US Government. Peterson K, Anderson J, Bourne D, Mackey K, Helfand M. Evidence brief: effectiveness of models used to deliver multimodal care for chronic musculoskeletal pain. VA ESP Project #09–1992017 May 3, 2017. Available from: https://www.hsrd.research.va.gov/publications/esp/chronicpain.cfm.